Back in mid-November, Roku announced that a new line of Philips-branded TVs would feature the Roku TV OS, and now we have specific details, release dates, and pricing for those TVs. The Philips Roku TV line will feature screen sizes of 40, 43, and 50 inches; these are LED/LCD TVs with a 1080p resolution, 120 Perfect Motion Rate technology, and wireless LAN 802.11ac built in. The 40-inch 40PFL4662/F7 is available now through Sam's Club for $349. The 50-inch 50PFL4662/F7 (shown here) will go on sale in January for $429. The release date for the $379 43-inch 43PFL4662/F7 is to be announced. P&F USA, Inc., the exclusive North American license partner for Philips consumer televisions and home video products, announced a new TV series that features the Roku OS, with the first model--the 40-inch class 40PFL4662/F7--available now in Sam's Clubs and online soon at Samsclub.com. The new Philips Roku TV 4000 Series includes three screen sizes: 40-inch class, 43-inch class, and 50-inch class. All three sets feature outstanding Philips TV picture and sound performance and the easy-to-use Roku home screen where inputs for OTA antennas, cable boxes, gaming consoles and devices are alongside favorite streaming channels. Philips Roku TVs provide access to 500,000+ movies and TV episodes across 5000+ streaming channels. The new TVs feature Roku OS 8, which includes a Smart Guide that shows over-the-air (OTA) broadcast TV and streaming options to help consumers search for, find and discover entertainment. The guide provides program information for local antenna broadcast TV channels from seven days in the past and up to 14 days in the future. Smart Guide also integrates the More Ways to Watch feature so users can see additional streaming options, such as whether a movie or show is also available to watch on-demand from popular streaming services, or if more episodes of a show are available to stream. Other Roku OS 8 features include TV Everywhere single sign-on, which eliminates the need to log into TVE channels multiple times. The Roku mobile app enables Private Listening for streaming entertainment and free local broadcast TV via an HDTV antenna, and Voice Search. The new Philips Roku TV 4000 Series offers Full HD resolution, 120 Perfect Motion Rate to provide clear and vibrant images in fast action scenes, wireless LAN 802.11ac MIMO for seamless streaming, and 16 watts of power with surround sound. • Visit the Philips website for more product information. 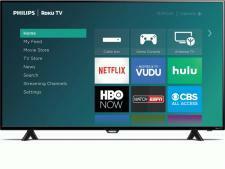 • Roku TV OS Is Coming to Philips-Branded TVs at HomeTheaterReview.com.